Though this video was shot a while ago, my opinion of the Organifi line is unchanged. Kombucha is a fermented beverage made from black tea and either sugar, honey or fruit, which has beneficial probiotic and antibiotic qualities. Once the solution is mixed, it is then fermented by a combination of bacteria and yeast better known as SCOBY (symbiotic colony of bacteria and yeast). There are numerous positive effects on the body, which are discussed here. Kombucha is loaded with good bacteria (known as probiotics), as well as enzymes and yeast which assist in breaking down foods for enhanced absorption and digestion. Since the mixture is doing some of the work in digestion, your gut is better able to do its job without being overloaded. Kombucha also restores a healthy pH balance in the gut, and its consumption is highly recommended for individuals dealing with irritable bowel syndrome, Candida overgrowth, and many other digestive disorders. The fermentation process involved in the production of kombucha also produces butyric acid, which has strong antimicrobial and anti-cancer features, protects the gut against yeast overgrowth, and destroys parasites which might be lurking in your gastrointestinal tract. The fermentation process involved in making kombucha produces by-products such as acetic acid, which inhibits the growth of harmful bacteria, thus conferring a protective effect upon the body against infection. Kombucha also contains naturally occurring glucosamine, so chugging this fermented beverage can also aid in joint function and health. It is also chock-full of vitamin C and vitamin B, and truly helps to cleanse the liver and rid the body of free radicals. I remember a roommate from 2008 who had begun drinking raw kombucha regularly, and he insisted that it was the most fantastic new health beverage. What I hadn’t realized then was that kombucha has actually been around for over 2,000 years, originating in China, then spreading to countries such as Korea, Japan, Russia, and India. My roommate kept insisting that I try kombucha, even when I told him that the slimy sludge floating in the bottles made me want to gag. I finally did try a sip of kombucha in 2009, and found that I didn’t like the incredibly tart, vinegary flavor at all. Despite my first unfavorable experience kombucha, I decided to try some of the newer brands, like Health-Ade, Synergy and Revive, last year. It turns out that kombucha has come a long way, with better flavor, and the SCOBY colonies are somehow less disgusting than what I remember from years ago. The fruitier versions are fizzy, refreshing, and quite tasty. Because of its acidity, kombucha should not be consumed in excess. My recommendation is to drink 4 ounces per day to obtain the probiotic benefits of this strange and popular beverage. Though I shot and edited this video a year ago, the information hasn’t changed. I love how clean Organifi products are, and encourage people to try them. My favorite products are the Daily Turmeric Boost and the ProBiotic. I’ve actually run out of both products, and am using other brands right now, but I honestly felt fantastic while on Organifi products. My digestive tract functioned better, and I had fewer aches and pains with the Turmeric Boost on board. If you suffer from sudden food sensitivities, aching joints, digestive upset, fatigue or weight gain, you may be suffering from leaky gut, which is also referred to as increased intestinal permeability. 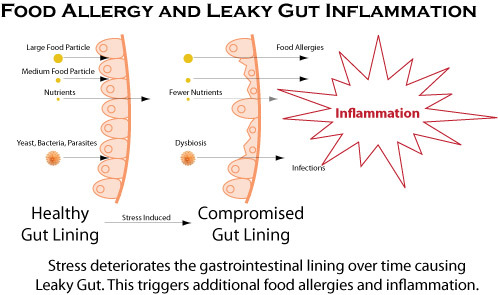 Leaky gut is characterized by the opening of pores in the small intestine, resulting in undigested food particles, bacteria, and toxins traveling to the bloodstream. The presence of these substances in the bloodstream triggers an immune response, whereby the body builds antibodies to the foreign substances but also attacks itself, creating food allergies and autoimmune disorders. 1. Chronic constipation – If you are usually constipated, toxins will often build up in stool, irritating the intestinal lining and causing inflammation, which then causes the pores in the small intestine to expand. In severe cases, Crohn’s Disease, irritable bowel syndrome,or colitis can occur. 2. Chronic stress – The immune system really takes a beating when subjected to chronic stress. If the immune response is compromised, pathogenic bacteria can cause widespread inflammation in the intestines, and leaky gut is a common result. 3. Dysbiosis – This is an imbalance between beneficial and harmful bacteria which can result from antibiotics or poor diet. Inflammation develops, causing the pores to widen. 4. Toxins – We are exposed to many thousands of toxins, but the worst offenders are found in our water supply, pesticides, and in certain medications. What Is The Solution If You Have A Leaky Gut? I have several dietary recommendations for treating a leaky gut. 1. Glutamine – I am already a big fan of glutamine in general, but especially for those who suffer from leaky gut. This amino acid has specific activity in the intestine, and restores healthy soft tissue in the region. Over time, regular supplementation with glutamine has a protective effect against intestinal disease. I tend to be fairly aggressive with glutamine and recommend 6 to 8 grams per day, or more if you engage in frequent exercise. 2. Fish oil – Try to find a formula which contains primarily omega-3 fatty acids. You can also increase your consumption of salmon. 3. Digestive enzymes – Digestive enzymes will aid in the breakdown of food substances, especially in older individuals and those suffering from leaky gut. Try taking them with every meal. 4. Betaine hydrochloric acid – Some people produce insufficient amounts of hydrochloric acid, which is needed to break down food in the stomach. If that is the case, betaine hydrochloric acid optimizes the process. 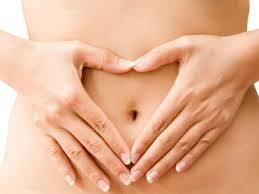 5. probiotics – Most individuals will benefit from adding probiotics into their daily regimen. Make sure to take at least 25 billion units per day for optimal gut health. If you have a tendency to slouch in your seat, you need to pay attention! Poor posture has detrimental effects not only on the body, but also on one’s mood and general attitude. Poor posture causes muscles in our neck and upper back to become overstretched, while causing other neck muscles and muscles in our torso and between our ribs to become cramped and overstimulated. The muscles in our chest become dominant, and pull our shoulders and upper arms inward and forward when we habitually adopt a stooped posture. This position puts a tremendous load on the diaphragm, and respiration suffers as a result. Even digestion becomes sluggish because the body cannot properly oxygenate and blood cannot circulate as well. Poor posture can negatively impact your emotional state and confidence, not to mention how others perceive you. If you’re slouching right now, think of how you feel emotionally, mentally. Are you down, depressed? Now sit up straight and take a couple of nice, deep breaths. You should notice an immediate shift in attitude and mood. Proper spinal alignment also has a positive effect on hormone levels. One Harvard study revealed that an erect posture, with shoulders back and spines nice and straight correlated with a 20 percent increase in testosterone levels and a 25 percent decrease in cortisol levels, while subjects who slouched experienced a 10 percent decrease in circulating testosterone levels and a 15 increase in cortisol. Lastly, the way you carry yourself has immense bearing on how others perceive you. If you meet someone whose shoulders are pulled forward, your impression may be that the person isn’t the most motivated or energetic you’ve met. Yet if that person had a nice upright stance, with shoulders pulled down and back, your impression would probably be very different. With some conscious effort, you can correct a hunched posture. Try this stretch at least a couple of times each day, and you will slowly begin to notice a correction in your posture. This is great for resetting the brain and creating more awareness of how you carry your body throughout the day. Stand with your back to a wall, feet together with heels touching wall, and arms hanging at your sides. Relax your shoulders, then pull them back so that they make contact with the wall. Stand in this position for 30 to 60 seconds, taking slow, deep breaths. When you are ready to step away from the wall, keep your shoulders in the same position. Be aware of how you are breathing, and how your back feels when your shoulders are kept back. I was recently introduced to a company called Nuzest, which is committed to developing nutritional products which optimize people’s diets and put them on the right track to feeling their best. The Clean Lean Protein is pea protein-based, allergen free, and a complete protein. It mixes beautifully, tastes great, and is highly digestible and absorbable, which sets it apart from the majority of proteins out there. Another outstanding feature of the Clean Lean Protein is the fact that it is one of the few alkaline proteins on the market, with a pH of 7.8. It’s paleo friendly too. If you are looking for a top-notch plant-based protein, look no further than Clean Lean Protein! Nuzest also has a greens product called Good Green Stuff which features over 75 ingredients for comprehensive nutritional support. Go to nuzest.com to order these great products, and be on the lookout for my video review of Clean Lean Protein on YouTube later this month!